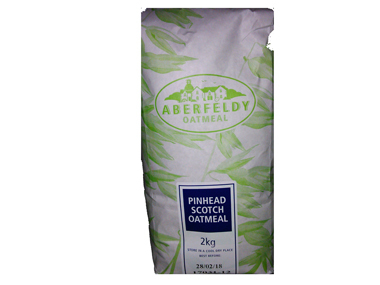 Buy Aberfeldy Scottish Pinhead Oatmeal 2kg in the UK from our online shop or directly from our independent Scottish store. Aberfeldy oatmeal (pinhead) is a very coarse oatmeal, it makes a very traditional bowl of porridge or can be used in soups. Pinhead (Scottish) oatmeal is also known as steel cut oat groats. A very coarse oatmeal, it can make a very traditional bowl of porridge and can also be used in soups to give body and also as a topping to pies, puddings and crumbles. Did you know: fine is the finest oatmeal, followed by medium oatmeal, followed by coarse oatmeal and the coarsest of them all is pinhead! As official Aberfeldy stockist, we sell genuine Oat Products directly from our shop in Scotland and online throughout the UK. Aberfeldy Oatmeal, run by Sandy Gray now continues to supply quality oatmeal and flour throughout the UK. They are a family business where Sarah and work together in supplying oatmeal. Fine oatmeal, medium oatmeal, coarse oatmeal and pinhead oatmeal. View more products from Aberfeldy. Where can you buy real Pinhead Oatmeal 2kg safely online? If you are wondering where you can buy Aberfeldy Scottish Pinhead Oatmeal 2kg safely online in the UK, then shop with us. We are an actual health foods shop; with real people selling real foods and products. Our award-winning independent shop is located in Stirling, Scotland since 1976. You can buy our Oatmeal and Flours and other genuine Oat Products in store or safely place an order with us online or over the phone. Pinhead Oatmeal 2kg - Aberfeldy Scottish Pinhead Oatmeal 2kg in Oat Products and Rice, Grains & Oats.